The Beall Center Presents: Manifest. 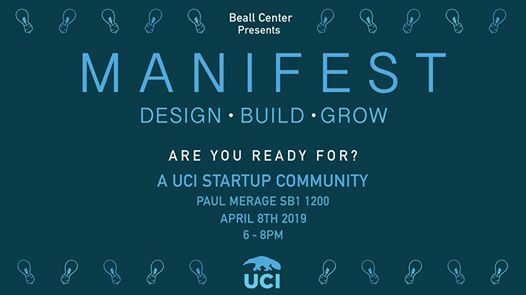 We are more than just a club, we are a community; Manifest will serve as the entrepreneurial hub for UCI students to network, collaborate, and innovate. Do you have an idea you can turn into cash? Do you have a passion that you would like to monetize? Come join the Manifest family at our first launch event. Expand your network, & learn internet age business skills to become a successful entrepreneur! 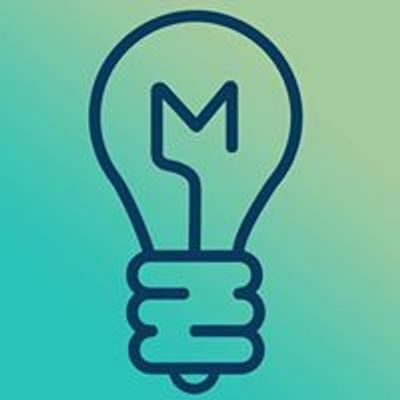 Manifest is a new organization focused on bringing together student entrepreneurs. We invite students from different areas of interest, from STEM Majors to Business Majors. Allowing students to build their own business as they apply new skills and knowledge acquired though collaboration! Get to know more about our mission as well as our team through our speaking engagements. 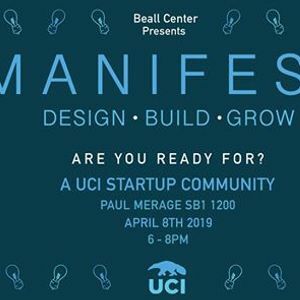 Our featured speakers include representatives from the center of UCI Applied Innovation, the Beall Center of Innovation and Entrepreneurship, and student entrepreneurs. Our launch will take place at the Paul Merage School of Business SB1 1200 on April 8th from 6PM to 8PM. Food and drinks will be provided. A giveaway will also be held at the end of the event! See you there!